Macrame is a fun crafting technique that has made a major comeback with the younger generation. Because it is only a series of knots in its most fundamental from, it is a really accessible project for almost anyone, especially adolescents and young adults. 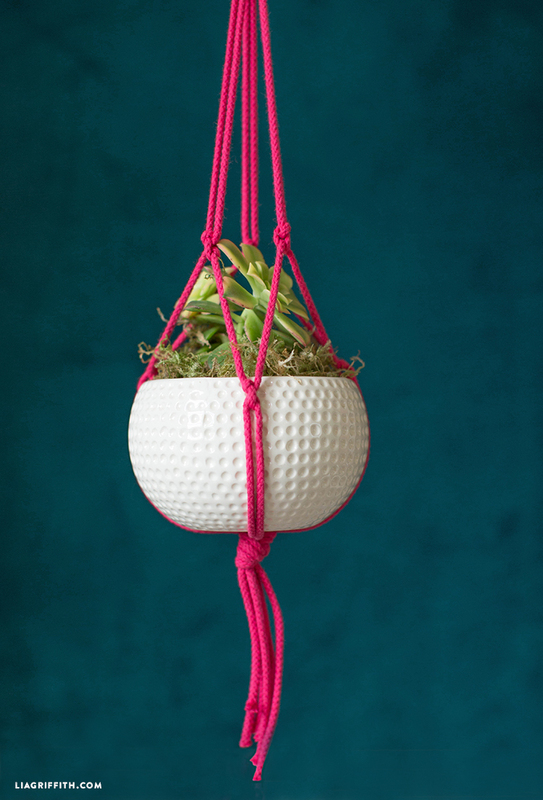 This DIY macrame plant hanger is one of those unicorn DIY projects – something that can appeal to all ages, only uses a few materials and crafters at any skill level can easily make. Score! This was originally made for our paper mache string of pearls plant, but now we are giving you the tutorial to make this plant holder for any of your botanicals. Cut three 54″ pieces of rope. Fold in half and tie onto the wood ring by creating a loop and pulling through (this is called a Larkshead knot). Starting 7″ down from the top ring, tie a half knot. Tie a second half knot in the reverse direction. Pull from either side to secure the knot. Tie three knots in total. Tie another series of knots 3 inches down from that row. At 4.5 inches down from that, gather all six ropes and tie a large knot. Trim the rope at the bottom of the planter. Macrame tends to be a very visual process, so follow along with our DIY macrame plant hanger photo tutorial below! We found our pink rope from Fabric Depot, but you should be able to find something similar at any craft store. 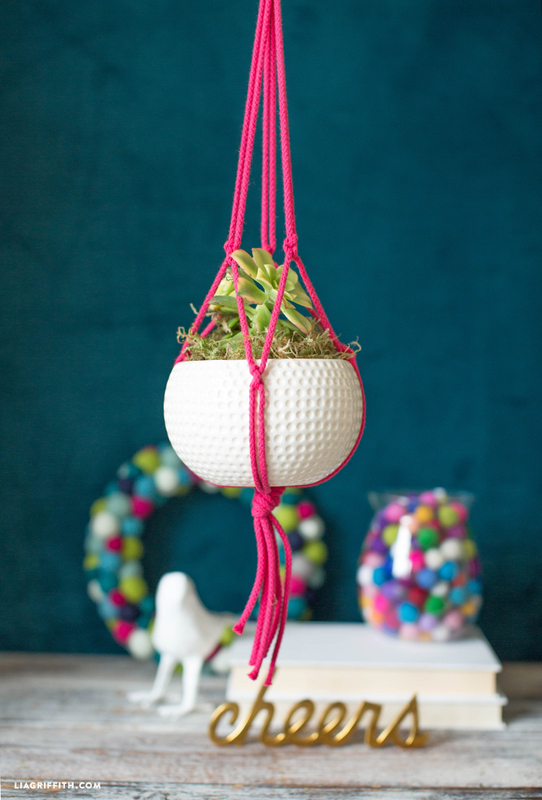 If you want to add an extra element of DIY to this plant hanger, feel free to buy white rope and dip dye it with your favorite colors. Play around with rope in different thicknesses to create different looks. Once you are finished, add in a succulent or botanical, or make one out of paper to display in your new plant hanger! How large is the planter you have pictured here? Planning this for a large group of women and wanting to possibly purchase the planters and plants as well. Oh fun! It’s about 6″ in diameter. Hi BJ! It looks like the chord pieces are 54″ each, so you’ll end up with the planter being around 3′ or so. But you can adjust the length of the finished piece to fit your needs! You’ll adjust where you tie the knots slightly depending on how long you need it. Hope this helps!